How Gov-Elect Gavin Newsom could shape California's future, issue by issue | We Stand With Seniors...Will You? Rumors of a major housing package in Newsom’s first year as governor are already circulating around the Capitol, although no one will say so outright. What would that package contain? Bank on increased funding for subsidized units one way or another, likely via increased tax credits for affordable housing developers and/or a revamped form of “redevelopment,” a controversial and abuse-fraught program Brown eliminated in 2011. But the other policies Newsom referenced either explicitly or obliquely in his campaign are far hairier politically. If Newsom is indeed able to broker a compromise on rent control, or tweak Proposition 13, or limit local control on housing development decisions, he will have accomplished something that has vexed politicians for decades. He also must decide whether to throw his weight behind major zoning changes, given that state Sen. Scott Wiener, Democrat from San Francisco, has promised to reintroduce a controversial and highly publicized bill that would strip from cities their zoning authority around public transportation. Newsom was lukewarm on the bill earlier this year. In speeches and campaign ads, that has translated into a focus on universal preschool, guaranteed prenatal care and more quality, affordable childcare. Newsom also has spoken adamantly about public investment in children younger than age 3 as an antidote to closing the chronic gap in achievement between disadvantaged and wealthier students. Besides preschool and childcare, Newsom has said he wants to create college savings accounts for the state’s incoming kindergarten students, focus on adolescent mental health and arts programs, and invest in data infrastructure that tracks student learning outcomes though college. The Legislature in recent years has also pushed a voluntary universal preschool program, as well as a requirement that schools report how they spent money targeted for needy kids; Brown resisted spending on new programs that incurred ongoing costs and preferred to give local school districts more decision-making authority. 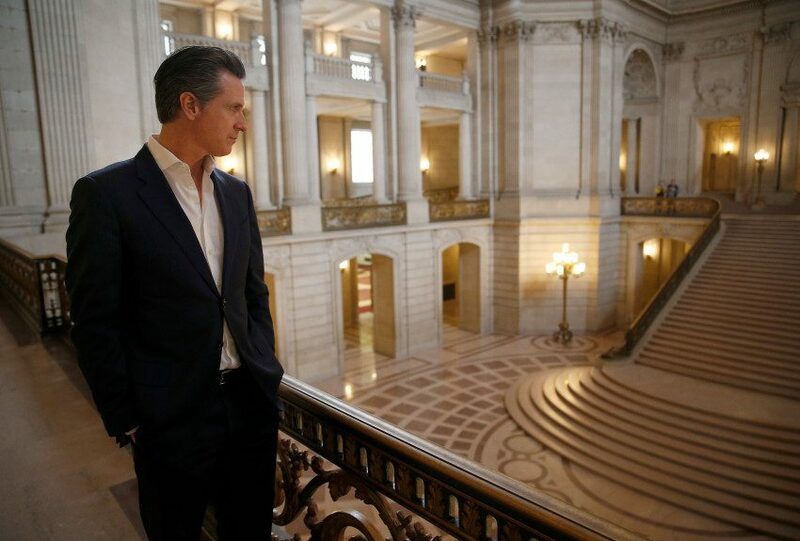 He has proposed the state offer two years of community college for free and provide college savings accounts for every kindergartner, an idea he implemented as San Francisco mayor amid a recession. As lieutenant governor, he has been a member of the UC and CSU governing boards, repeatedly voting against tuition and fee hikes—drawing praise from students and concern from some administrators. Now he’ll face pressure to address improving but still anemic graduation rates at CSU, campuses that need retrofitting and a rising cost of living for students—a stubborn issue on which Newsom has not made specific commitments. Eagan said faculty will be watching in January to see if Newsom proposes a state budget that avoids further student fee increases. For example, the new law banning money bail calls for each county to set up ways to evaluate people who have been charged with crimes to help determine if they should be held in jail while they await trial. That work could start now—even while the bail industry is trying to overturn the law—so supporters of ending bail will be watching to see how much money Newsom proposes to help counties establish pretrial services. If the bail industry qualifies a referendum for the 2020 ballot, Newsom will likely play political defense to try to protect the precedent-setting lawsigned by Gov. Jerry Brown. Legislators shelved a bill this year to raise the legal standard for police use of force, but a new version will likely be back next year. On drug policy, Newsom has already demonstrated his differences from Brown. The governor-elect led the campaign to legalize marijuana, which Brown did not get involved in, and said he is “very open” to a bill Brown vetoed allowing San Francisco to establish a legal clinic where addicts could shoot illegal drugs. But the good times won’t last forever. Newsom has spoken broadly, if a little vaguely, about the need to rejigger the state’s tax code to flatten things out. Expanding the sales tax to services, an oil severance free and revising the property tax limits of Prop. 13 are all “on the table,” he has said. The state Supreme Court will soon hear a case about whether future benefits can be pared down. But even if the court give the governor that tool, he may be reluctant to wield it. And for many cities whose budgets are already being swamped by these costs, that ruling may not hold off bankruptcy, said Genest.